It’s officially spring. We can’t wait for the weather to catch up with the calendar, but while we are all waiting (patiently), here are a few things happening here at the PWCVB and with our partners. The PWCVB is currently promoting events, specials and more on dedicated Easter and April Vacation pages. Be sure to submit your events to our calendar, as they are listed on these and future promotional pages. It may take up to seven days for your event to be posted on our website, so please plan accordingly. There is no need to include dates, times, pricing and locations in the description of your event as there are specific spots in the form to add this information. Limit your description to 180 characters if it all possible. If you have any questions or difficulties, please reach out to CRM Database and Research Coordinator Beth-Anne Tremaine. The PWCVB&apos;s next monthly Partner Meeting will be held at McCoy Stadium on Thursday, April 20 from 3:30 to 5 p.m. An email invitation will be sent soon. This is a great way to network with your fellow partners and to learn what&apos;s happening at the PWCVB. Check out our latest "Small Bites" videos, part of our partnership with the Providence Journal. From scrumptious scones to savory stuffies, you&apos;ll be cooking up a storm in no time. And in case you missed it, the PWCVB&apos;s Annual Report is available on our website here. Welcome to KG Kitchen Bar, a great new addition to Hope Street. Opened by Chef Kevin Gaudreau, who is a nationally recognized, award-winning, culinary artist, KG Kitchen Bar serves fresh, flavorful comfort food. If you have some time, check out Rhode Island Monthly’s new website, RIMonthly.com, and see their new, modern and user-friendly design. 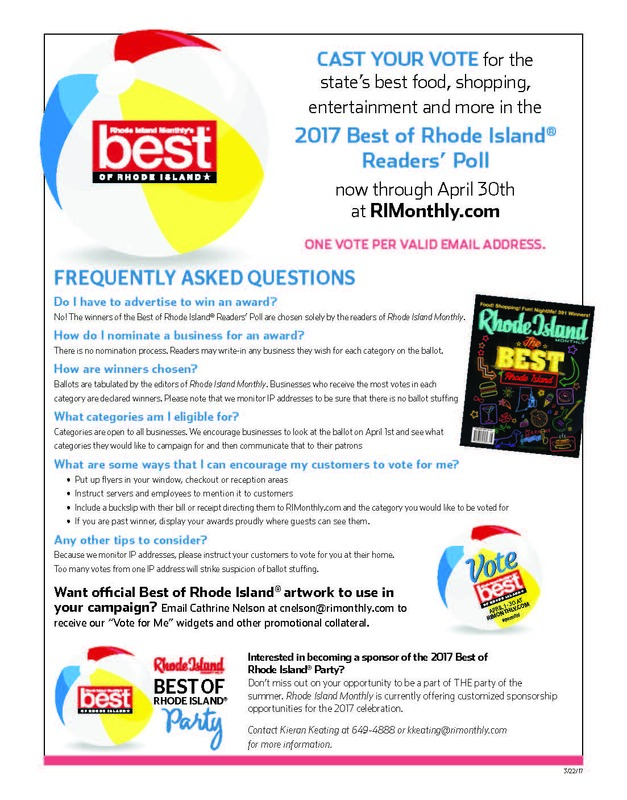 In related news, Rhode Island Monthly’s Best of Rhode Island Readers’ Poll runs now through April 30 at RIMonthly.com. Cast your vote for your favorite places to eat, shop, and have fun in both statewide and regional categories. Remember that there is only one vote per valid email address and every vote counts. Are you a business interested in campaigning for an award? Learn tips and more by downloading their fact sheet here. Anyone been to Sydney? Not the one in Australia, but the new café in Providence between Jacky’s Waterplace and the train station. The ricotta toast is to die for, as are the soups and sandwiches. Once you go, you’ll be there so often, they’ll all say “Hi Norm” when you walk in. Guess what we’ll be seeing out of our office windows as of May 1? Providence Kayak will be opening for all you beginner or seasoned kayakers. Speaking of the WaterFire basin, have you seen Skyline at Waterplace yet? Its ribbon cutting was last week and it is gorgeous. They already have a lot of events booked, so if you’re interested, get in there soon. And, of course, it wouldn’t be spring without talk of Easter. There’s plenty to do on Easter with the amount of PWCVB partners offering dining specials and events. Go to our Easter page and see how you can have tea with the Easter Bunny as well as an egg hunt at Blithewold Mansion, Gardens & Arboretum. As if you needed another excuse to wear a frilly pastel-colored dress!